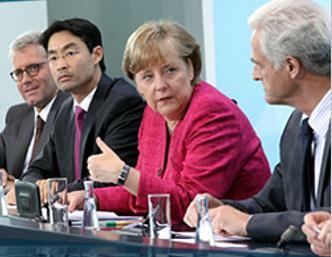 BERLIN, Germany, May 30, 2011 (ENS) – German Chancellor Angela Merkel announced Monday that her government has decided to close all 17 nuclear power plants in the country by 2022. In the wake of Japan’s Fukushima nuclear disaster, and amidst widespread public protests against nuclear energy, Merkel said Germany plans to replace atomic power generation with renewable sources of energy. “We believe that we, as a country, can be a pioneer for a new age of renewable energy sources,” Merkel said at a news conference shortly after her center-right coalition government drew up a timetable for the nuclear phaseout. “We believe that we can show those countries who decide to abandon nuclear power – or not to start using it – how it is possible to achieve growth, creating jobs and economic prosperity while shifting the energy supply toward renewable energies,” said Merkel. Nuclear power currently supplies about 22 percent of Germany’s energy needs. If the plan is approved by Parliament, Germany will become the second major industrialized nation to abandon nuclear power. Italy too has abandoned nuclear energy, which was voted down in a referendum after the 1986 Chernobyl disaster. Merkel, who holds a doctorate degree in physics, said the decision was taken in view of Japan’s ongoing nuclear crisis. Japan and Tokyo Electric Power Co. are still struggling to control radiation from the Fukushima Daiichi nuclear power plant, damaged when the March 11 earthquake and tsunami caused the loss of power to its nuclear fuel cooling systems. Hydrogen gas explosions and a meltdown of the power plant’s nuclear fuel spread radiation into the atmosphere, the soil and the Pacific Ocean. “Although Japan is a highly developed industrialized nation, it was powerless to prevent a nuclear threat in the wake of a natural disaster. That is the reality,” Merkel said. According to the Merkel government’s plan, the country’s seven oldest reactors, which were taken offline following the Fukushima disaster, will not be restarted. The Kruemmel plant, which has been offline for years due to technical problems, will not be restarted either. The plan also calls for one of the older nuclear plants to be kept on “standby” from 2013, in case of electricity shortages. Another six plants will be closed by the end of 2021 and the three newest will remain operational until 2022. Germany’s four top nuclear energy firms – Eon, RWE, EnBw and Swedish-based Vattenfall – last month prepared a lawsuit against the German government’s decision to idle seven of Germany’s 17 nuclear power stations by 2021. It expected to be filed by RWE. The four nuclear energy firms warned that Germany could face widespread winter blackouts, if the government phases out nuclear power, a finding challenged by a recent study conducted by the nonprofit German Watch. On Monday, the Federation of German Industry, BDI, said the shutdown could force Germany to build more coal and gas power plants to stabilize the energy supply and price, leading to more greenhouse gas emissions. In 2000, the coalition government of the Social Democratic Party and the Green Party announced their decision to phase out nuclear power plants by 2020. Last fall, Merkel announced that she would extend the life of Germany’s nuclear plants of 12 years on average. But she revised that position in March as a result of the Fukushima Daiichi disaster in Japan and of late March elections in two German states accompanied by direct protest actions throughout Germany. 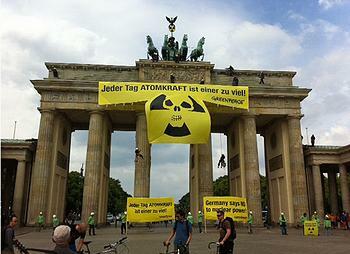 Since then, there has been mounting public pressure on the Merkel government to phase out nuclear power. On Saturday, there were nationwide demonstrations in at least 20 cities attended by over 100,000 to protest against nuclear energy. In Berlin alone, over 20,000 persons demonstrated. 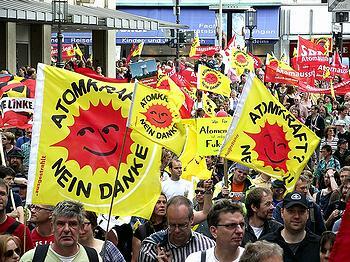 During the previous week, hundreds of anti-nuclear demonstrators marched in the streets of Berlin in the pouring rain in protest of the annual convention nuclear technologists at the Berlin Congress Center. Chancellor Merkel said today that her government plans to replace nuclear energy with renewable sources of power. According to government data, the German renewable energy sector already employs some 370,000 people. Federal Secretary of the Environment Norbert Röttgen said today that Germany’s renewable energy industry must be subsidized to give it a stronger market and competition orientation. Röttgen stressed that the coalition government intends to bring the entire country into agreement with its new nuclear policy. “A consent is to be aimed at also in the ultimate nuclear waste disposal question,” he said.